Tuesday: The packing team arrived at our old house to pack everything. By the time they were done - mid-afternoon - the blizzard had set in with full force, and it was craziness. The boys had a snow day that day (and the next day was supposed to be their last day at their old school). Our dear neighbors had all the kids at their house to play that day, as our house was not much fun, what with all the TVs and video games packed up. So we picked up the boys after the packing team left, then drove to the hotel where we were supposed to be staying for a single night. That single night turned into three nights. The snow was insane! I've never seen anything like it. By early evening, the moving company had called to reschedule our loading from Wednesday to Thursday. Wednesday: By morning, there was at least 12 inches of snow on the ground. Another snow day for the schools. Turns out the boys wouldn't be going back to their old school. :( They were okay with it, but I was sad for them. The best part: Byron and I spent three hours shoveling the driveway and the sidewalks in preparation for the loading team to come to the house to pack us up. We got a call mid-morning that the movers wouldn't be able to be there until Friday. So we went back to the hotel to stay another night. Thursday: Even with the load being delayed, I knew the boys and I would have to go to Lincoln regardless. We had a carpet cleaning appt that afternoon at the new house, and the boys were supposed to start their new school the next day. So we left Byron to deal with the loading up of all our worldly possessions. Which is probably just as well, considering how freaked out I was just seeing all our stuff in boxes. The boys and I arrived in Lincoln and set up camp in our new house with air mattresses and suitcases. Friday: I had called the new school from the road the day before and told them the boys wouldn't be starting until Monday. I just couldn't deal with one more thing - I admit it, I was stretched to the absolute limit. So Friday was a pretty boring day (thankfully). 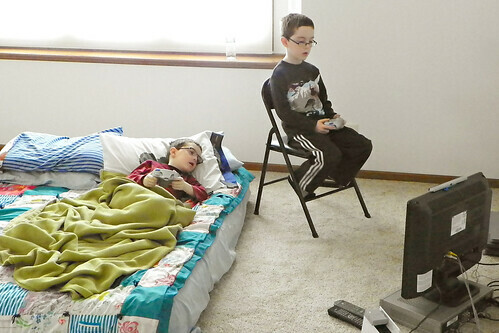 I set up a makeshift office so I could get some work done, and the boys played video games for pretty much the entire day. I'm not apologizing. We did what we had to do. Luckily, the loading team arrived in KC that morning, loaded everything up, and Byron was able to get to Lincoln that night. We were finally all together, including Daisy, who rode up with Byron. 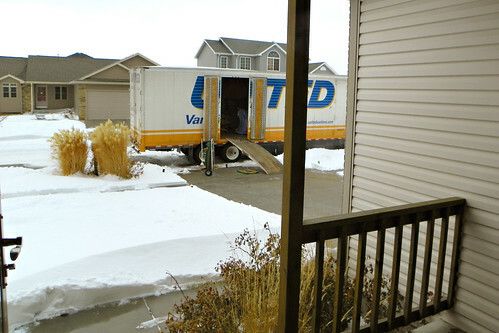 Saturday: Bright and early, the moving truck arrived to deliver at our new house. My dad took the boys to his apartment for the day. Byron and I had a weird day of standing around and watching people do a lot of work, directing traffic, and basically wondering how in the world all this stuff fit into our old tiny house. The crew was done by early afternoon, leaving Byron and I to wander around, not knowing where to start. We got the boys home and decided to call it a day.